This page provides an outline history of the former Callington Branch railway line. Please click here for an Index of all Callington Branch pages in RailWest. The town of Callington is situated in the east of the county of Cornwall, in an area that once supported many mines and quarries. During the second half of the 19th Century there were a number of proposals for railways in the area, either specifically to serve the Callington area and its industries, or as part of larger railway schemes within Devon and Cornwall. In 1862 the Tamar, Kit Hill and Callington Railway Company (TKH&CR) was formed to construct a railway to connect Callington and the mines to the quays at Calstock, where the minerals could be loaded into barges on the River Tamar. The first sod of the TKH&CR was cut on 26-Nov-1863 at Kelly Quay, Calstock. In the following year an Act of Parliament was obtained and the company was restructured, but a financial crisis in 1866 halted construction. In due course a proposal emerged for a new Callington and Calstock Railway to take over and complete the TKH&CR and this was authorised by an Act of Parliament on 9-Aug-1869. A further Act was obtained on 25-May-1871 for the railway to be re-named again as the East Cornwall Mineral Railway and it is by this name that probably it is best known (and is described in these pages). The railway was constructed as a mineral railway of 3' 6" gauge and was opened officially on 7-May-1872, although by that date some sections had been in use for as long as five years previously. The line was almost 8 miles long and ran from Kelly Bray (about 1� miles north of Callington) to Calstock, where there was a rope-worked incline about 800' long which dropped some 350' to reach the quays. It appears that the quay lines themselves and the associated incline had been in existence before the ECMR was built as the property of the Tamar Coal, Manure and General Merchandise Company, who had used the incline to haul coal up the steep sides of the valley. The area at the head of the incline appears to have been known variously as Kelly or Kelly Incline, but also later as Incline Station (which is the term used in these pages). The East Cornwall Mineral Railway (ECMR) had public depots at Kelly Bray, Monks Corner, Cox's Park, Drakewalls and on Calstock Quay, as well as private sidings at various intermediate locations. The ECMR owned two Neilson locomotives (numbered 1 and 2) which worked on the section from Kelly Bray to Incline Station at the head of the incline to the Quay - the quay lines themselves were shunted by horses. Although only a mineral line, a rudimentary form of signalling was provided and there were semaphore signals at Cox's Park, Monks Corner and Kelly Bray. The single line from Kelly Bray to Incline Station was worked on the time interval system, combined with the single-needle telegraph, and there was a passing loop at Cox's Park There were seven public level-crossings, four manned by gate-keepers, but no signals were provided and no lights were allowed to shine in the direction of the railway from the gatekeepers' houses between sunset and sunrise. In 1890 the Plymouth, Devonport & South Western Junction Railway (PD&SWJR) opened a standard-gauge double-track line from Devonport to Lydford, where it joined with the main line of the London & South Western Railway (L&SWR) from Exeter via Okehampton. The PD&SWJR line was leased to the L&SWR, who worked it as an integral part of their main line from Exeter to Plymouth. In 1891 the PD&SWJR purchased the ECMR and in 1900 they obtained an Act of Parliament for a new Bere Alston & Calstock Light Railway to extend the ECMR eastwards to join with the PD&SWJR main line at Bere Alston. The new extension was to diverge from the original line of the ECMR about half a mile south of Gunnislake and follow a new route into Calstock. From the point of divergence the by-passed section of the ECMR back towards Calstock would be abandoned, including the old incline down to the Quay. Originally the extension was planned as 3' 6" gauge also, but in 1905 a further Act authorised use of the 4' 8�" standard gauge, with the ECMR being converted and worked as a Light Railway. The Engineers for the new extension were Galbraith and Church, whilst the task of converting the ECMR was entrusted to Colonel HF Stephens (the well-known Light Railway enthusiast). After the line was opened to passenger traffic Col Stephens was appointed as the General Manager, but it appears that he was sacked after a year because he was absent from the line far more frequently than his contract permitted. The eastward extension involved the crossing of the River Tamar, which forms the boundary between Devon and Cornwall in this area. 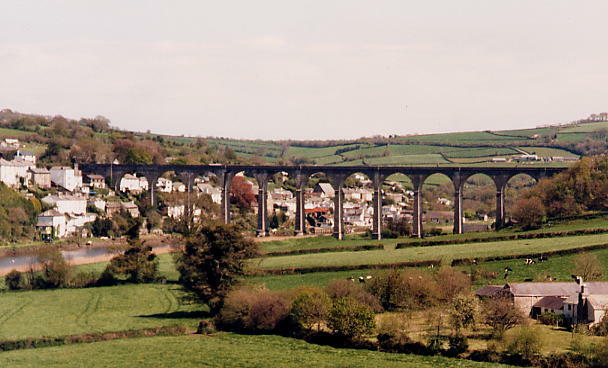 This was achieved by the construction of the Calstock Viaduct, an elegant structure of 12 arches 850' long which carries the railway almost 120' above the river. Despite the abundance of granite in the area the viaduct was built from concrete, the contractors being Langs of Liskeard. Apart from some sections cast 'in situ' the bulk of the structure was constructed from a total of 11,148 individual blocks, each weighing at least 1 ton and cast from concrete at the site. The work was not without its problems and there were particular difficulties with the foundations of the piers in the river. This viaduct remains in use today as a monument to an engineering practice which was rapidly superseded by ferro-concrete. The extension was known officially as the "Bere Alston & Calstock Light Railway", but often it was referred to simply as the "Calstock Light Railway" and this term seems to have been used also for the whole line. Click [here] for a detailed description of the route of the line in its new form. The entire line was inspected for the Board of Trade by Major JW Pringle on 5-Feb-1908 - it opened then for goods traffic on 17th February and for passengers on 2nd March. It is said that traffic on the old ECMR had been suspended for only two days during the whole conversion process. The old ECMR goods depots were replaced by new passenger stations at Callington Road (Kelly Bray), Stoke Climsland (Monks Corner), Latchley (Cox's Park), Gunnislake (Drakewells) and Calstock, as well as an interchange with the L&SWR at Bere Alston. An additional station was opened at Chilsworthy on 1-June-1909 and a halt at Seven Stones on 15-June-1910, although the latter was closed again during World War I. On 1-Nov-1909 the station at Stoke Climsland was renamed Luckett, whilst at the same time Callington Road became 'Callington for Stoke Climsland', although the suffix was dropped eventually circa-1948. In addition to various public goods sidings at the main stations there were a number of private sidings at intermediate locations - click [here] for more details. During the reconstruction the signalling was upgraded to standard in keeping with the Light Railway status and small ground-level signal-boxes were provided at several locations. Click [here] for more detailed information about the signalling. The PD&SWJR purchased three new locomotives from Hawthorn Leslie, as well as a variety of goods and passenger rolling stock, in order to operate their reconstructed line. The new station at Calstock was adjacent to the Cornwall end of the viaduct, at a much higher level than the original line on the Quay. In connection with the abandonment of the old ECMR Incline to Calstock Quay a new wagon-lift was constructed at Calstock station, adjacent to the south side of the viaduct and connected to a siding in the new goods yard. This lift, built by Head Wrightson and Company of Cleveland, could transfer a single wagon at a time to/from the sidings on the Quay, which were re-gauged. In contrast with their 'main line' the PD&SWJR retained control of the branch as an independant railway until they were absorbed by the L&SWR in December 1922. In 1923 the L&SWR then became part of the Southern Railway at the 'Grouping' of most UK railways. After nationalisation the Callington Branch was controlled variously by the Southern and Western Regions of British Railways, as different boundary changes took effect. During the early 1960s the freight traffic declined and steam gave way to diesel multiple units (DMUs) for the passenger service. There was talk of total closure, but the poor road access in the area meant that the Calstock Viaduct remained an important link across the Tamar. On the ex-L&SWR main line the section from Bere Alston to Meldon Quarry was closed completely on 6-May-1968, leaving Bere Alston as the terminus of a branch from Plymouth. The passenger service was revised so that trains ran through from Plymouth to Gunnislake with a reversal at Bere Alston. The layout at Bere Alston was modified so that the branch made a simple trailing connection with the former Up Main - the old 'main line' to St Budeaux was still double-track, but the direction was changed so that it was now 'up' to Plymouth rather than 'down'. Down DMUs arrived at Bere Alston and stopped at the former Up platform, then pulled forward and reversed onto the branch. In the return direction the DMU ran off the branch onto the old Up main, then reversed across a crossover onto the old Down main and ran back to Plymouth. On 7-Sep-1970 Bere Alston signal-box was closed and the line to St Budeaux reduced to a single track serving the former Down platform, which is now the only one in use. The branch was re-aligned to make a new junction at the south end of the former Down platform - this junction is controlled by a 2-lever ground-frame, which is released by the train staff for the section and worked by the guard. In 1994 the old station at Gunnislake was closed and on 6th June a new platform was opened a few chains to the east, on the site of the former coal yard once served by Perry Spear's siding. This alteration enabled the removal of the railway bridge over the A390 road, whose low headroom had been a source of trouble for many years. The line is operated now (2012) under the "Tamar Valley Line" banner.